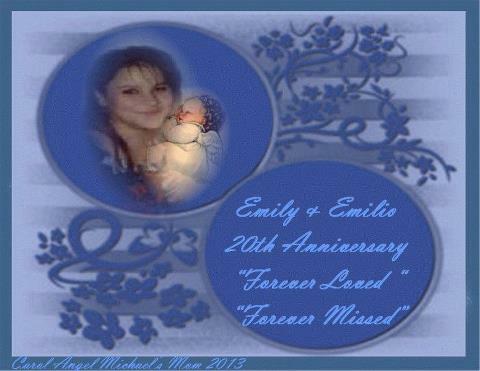 On this, the 20th Anniversary of Emily and Emilio's death, I want to thank all those who have been so wonderful and supportive of Theresa and to all our family through all the things we have had to face these long years past waiting for new that something had been done finally and that Justice would finally be served. Unfortunately that isn't the case, and as every day goes by it seems less and less likely that Justice will ever be served. I am totally disgusted with the system set up to make sure that the law works in everyone's favor and that it can only really work if you have the funds to buy it. 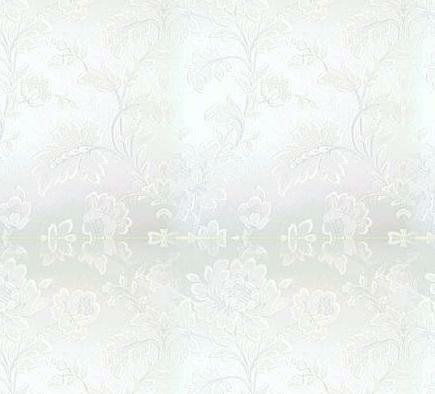 I suppose that in the past I was naive to think that we are all equal in the eyes of the law. It's a shame that isn't the case. It should be. 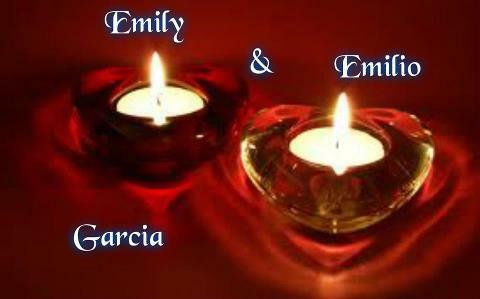 Hopefully Emily and Emilio are at peace wherever they are. Karma should take care of those that the law hasn't, and anyone else that has had a hand in making sure this case isn't finished. 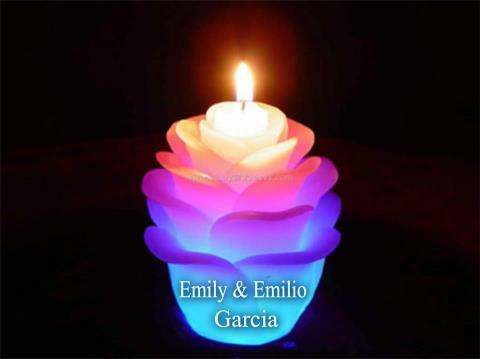 I'm sure that Karma will not be lenient, but will dish out punishments equal to the disrespect accorded to my Emily and her unborn child Emilio. 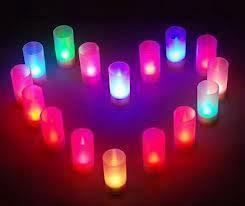 Once again, thank you to everyone who has cared for them and for us all enough to give us the moral support needed at different times when those time got tough. But no matter the age, we cry the same tears. The path we walk is hard and long. To survive the pain of them being gone. Because together we can make it day by day. Because we are Angel Moms and Dads together we are strong! 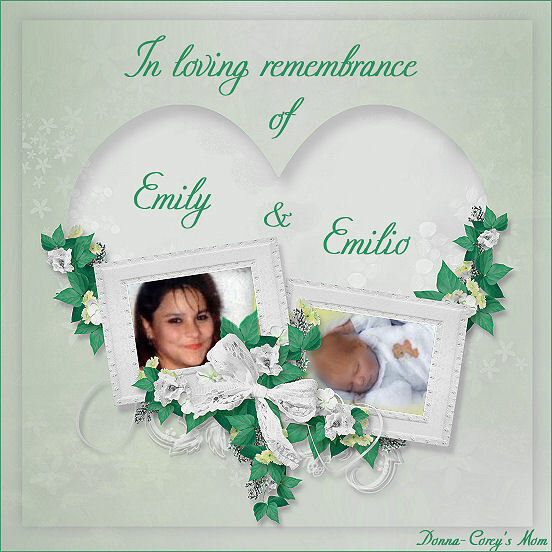 This poem dedicated to our Angels Emily & Emilio Garcia and to all of the wonderful Angel Families that we have met during our 20 year search for justice. God bless them all. 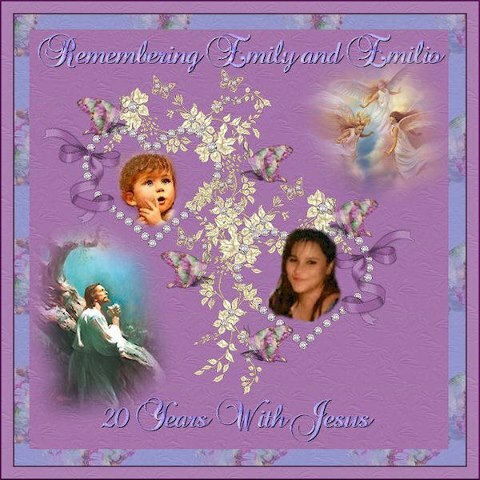 Below you will find all of the beautiful gifts that were made by our dear friends for Emily & Emilio for their 20th Anniversary in Heaven.Thank you all so very much for the gifts and for remembering our Angels on such a special day. 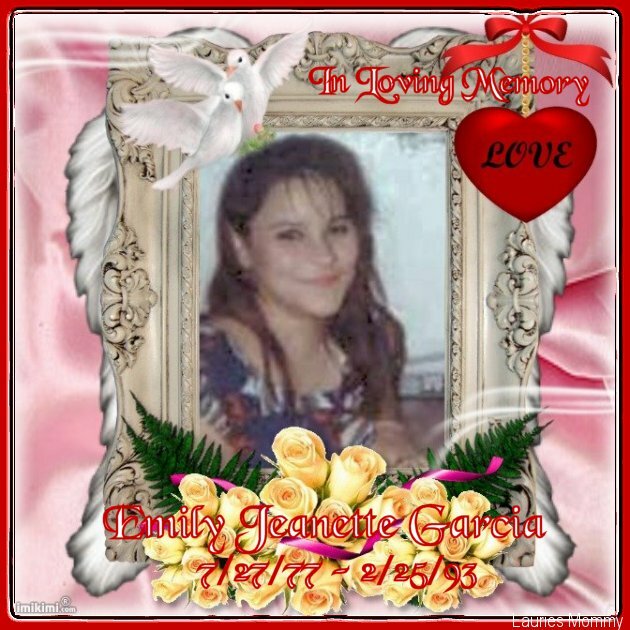 Please click on each of the gifts and it will take you to the personal web site of each of their Angel Friends.God bless you all. 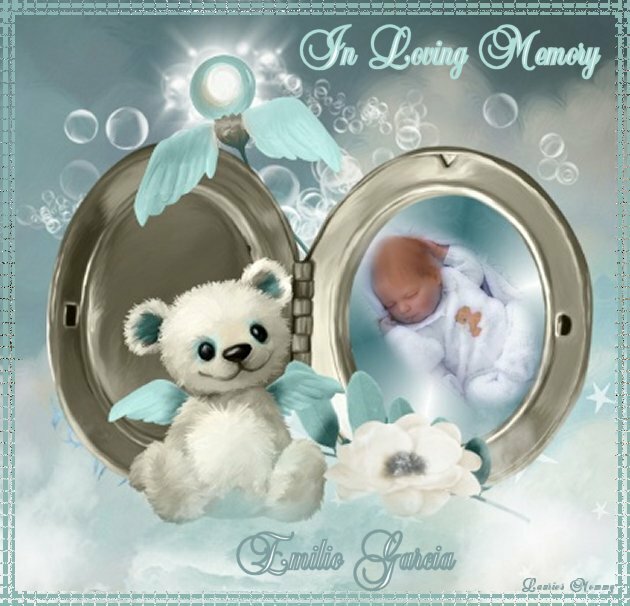 The above gift is from my dear friend Carol Carico and her Angel Son Michael. Thank you, Carol and God bless you. The above 2 gifts are from my dear friend Christine Pollock and her Angel Daughter Deborah. Thank you, Christine and God bless you. The above 2 gifts are from my dear friend Shirley Baer and her Angel Daughter Laurie. Thank you, Shirley and God bless you. 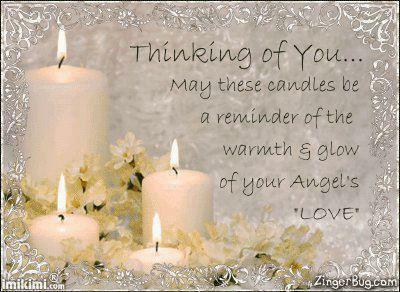 The above gift is from my dear friend Donna James and her Angels Corey & Michelle. Thank you, Donna and God bless you. 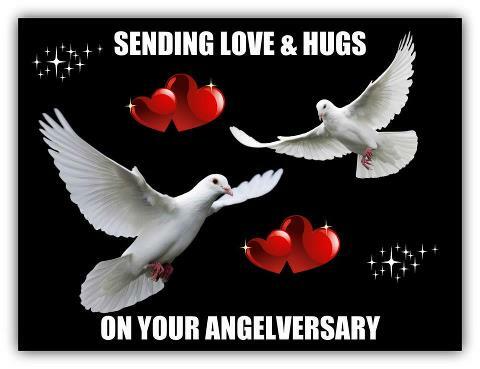 The above gift is from my dear friend Linda Rice and her Angel Daughter Tina Marie. Thank you, Linda and God bless you. The above 2 gifts are from my dear friend Linda Christian.Thank you, Linda and God bless you. The above gift is from my dear friend CherylRoy.Thank you, Cheryl and God bless you. The above gift is from my dear friend JackieWergin Trudeau.Thank you, Jackie and God bless you. The above gift is from my dear friend Marlene Borchert.Thank you, Marlene and God bless you. 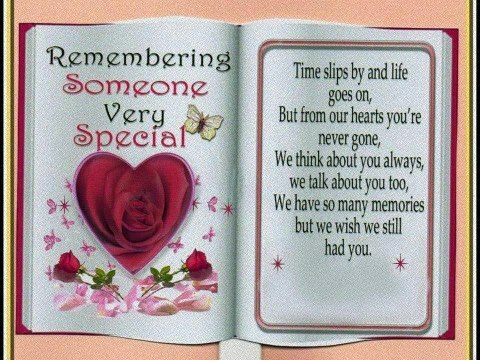 The above gift is from my dear friend Melody Hill.Thank you, Melody and God bless you. The above gift is from my dear friend Nancy Tuz.Thank you, Nancy and God bless you. 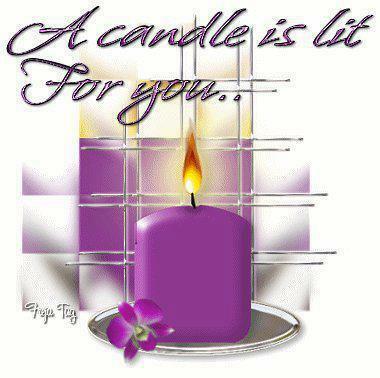 The above gift is from my dear friend Wadalisi Lance.Thank you, and Wadalisi & God bless you. 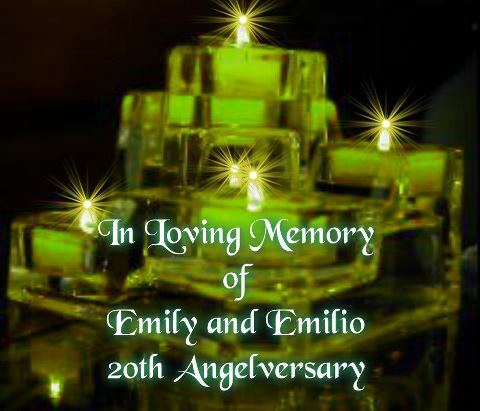 I would also like to say a special thank you to the following people who left messages in guestbooks, emails, leaving messages on Facebook, and sent their thoughts and prayers to our family as we celebrated Emily & Emilio's 20th Anniversary In Heaven. Thank you all and God bless you.